Do you love books about books? Most serious book worms do. I know I sure love them. I am always happy to read a book that has the potential to add so many titles to my want to read list. If you're a reader, people like to ask what your favorite book is or what kind of books you like to read or what book changed your life. The answer to the latter portion of the question is that every book changes your life. Sometimes the ways in which this happens are big and obvious and sometimes the ways are so small as to be almost dismissable. Sometimes the ways depend on what else is going on in your life and your head when you read that particular book. I believe that each book, from the fluffiest fluff to the most serious philosophy becomes a part of you, shapes you and your way of thinking, changes you. So when a book like Schwalbe's essay collection about his reading life examined and illustrated with pieces of his non-book life comes along, it's a sure bet that I'll read it. 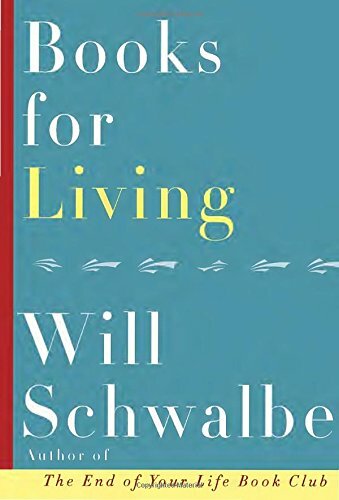 Schwalbe believes that you can find everything you need in a book and his collection of essays discuss what he has taken away from the books he's read, how it has made him look at his life in particular but also life and society in general. The essays center around a whole variety of books, classics and modern/recent books both. The reader sees right into the very soul of Schwalbe through the lens of the books that have shaped his thinking and his being and can, if they so choose, take Schwalbe's choices as suggestions for their own further reading and examination. His writing is conversational and accessible, personal and approachable. The books that touched Schwalbe came at just the right moment for him to read and reflect on them in terms of his life, his experience, and as such they are unlikely to represent the same things to his readers. I know several of the books he notes as seminal in his reading life left me cold but I have my own books that he doesn't mention. And that, of course, is the beauty of reading. We all come away from each book with something incredibly personal. Reading Schwalbe's insights into his reading did make me reflect on my own and seeing into the heart of someone else's life through their reading was fascinating. This is a type of reflective memoir I can really get behind. It's so true...every book changes your life!